Starbucks‘ Happy Hour is back with a BOGO offer (Buy One, Get One Free). Buy any handcrafted espresso beverage (grande or larger), and get one for free during Happy Hour on Thursday, February 14, 2019 from 3pm–close (in your time zone). 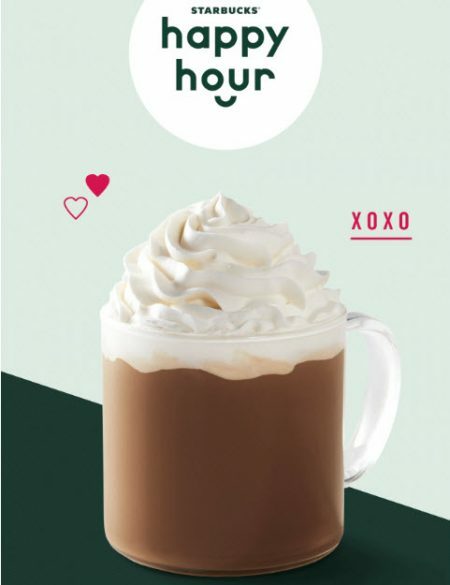 Offer valid 2/14/19 only after 3 p.m. at participating Starbucks® stores in Canada. Offer excludes hot and iced brewed coffee, ready to drink beverages, Starbucks Reserve beverages and Frappuccino blended beverages. Cannot be combined with any other offer or discount. Offer valid for one-time use.